I neglected posting this excellent Skyrim papercraft when it was released by Brandon (z8-0) back in December, but it came to my attention again when I saw this awesome build photo by Kurado3. This full scale paper model helmet is based on a 3D model from the Elder Scrolls V: Skyrim video game. 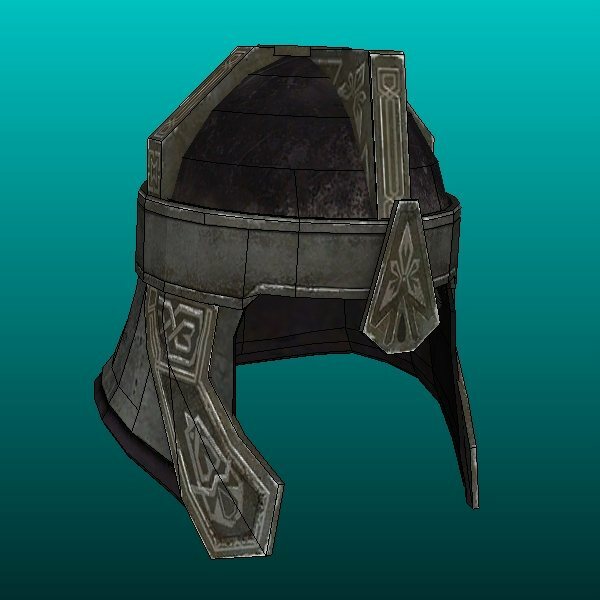 In the game the helmet is found on the remains of the Nede warrior Yngol in the barrow where he is buried. Printable template downloads are located here. 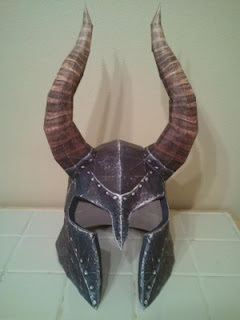 Previously posted Skyrim helmets: iron helmet and Daedric armor helmet. With a new movie coming out next month, thoughts are beginning to turn to Batman papercraft. 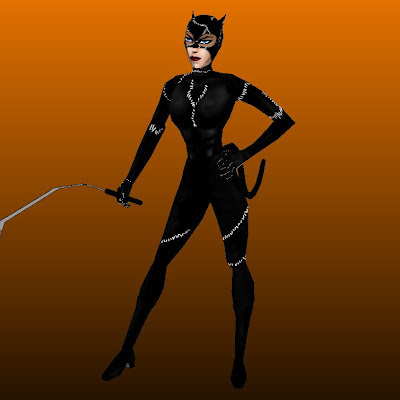 ^^ This Catwoman paper model was created in 2008 by Phh29 and resembles the version of the feline villain seen in Tim Burton's 1992 movie Batman Returns. 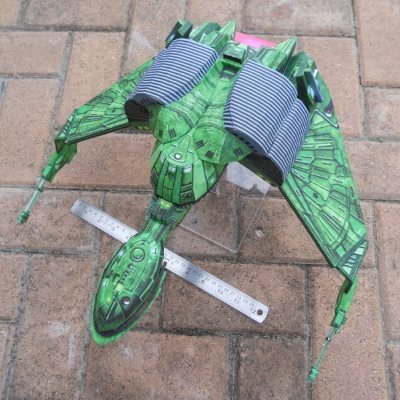 This model comes in Pepakura PDO format only and is available in both 21cm and 31cm versions. Download links for the templates are located at maquettes-papier.net. 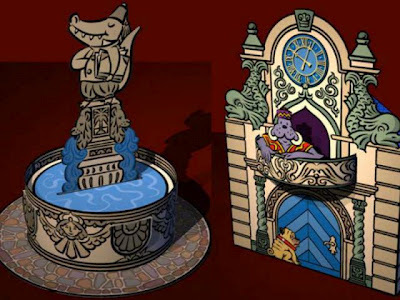 Sometimes papercraft is good enough it reaches the status of "paper art". 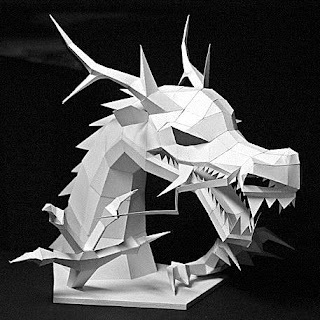 Such is the case with this Asian dragon head paper model by Cheek Patch. Ancient documents from the Han Dynasty in China describe Asian dragons as having "a camel's head, a demon's eyes, a cow's ears, a deer's horns, a clam's belly, a snake's neck, an eagle's claws, a tiger's paws and 117 carp scales." (a tad bit more complex than an European dragon don't you think? ^^). The free PDF template for this paper sculpture may be downloaded here. 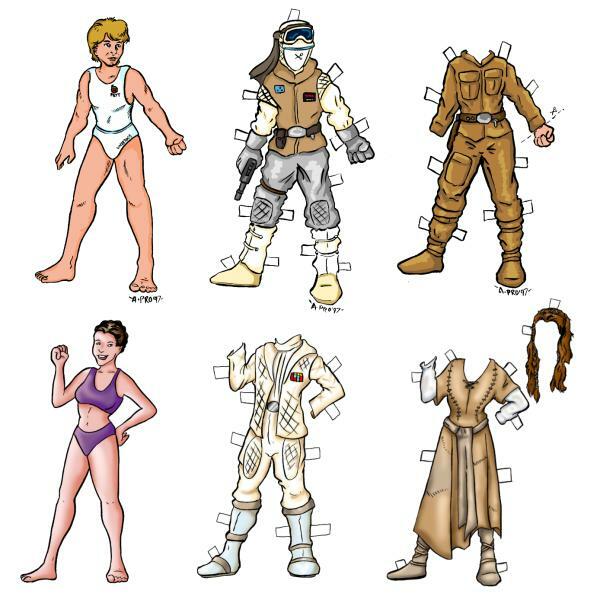 Amy Pronovost is a graphic designer who loves Star Wars, so she made use of her skills to create hand drawn Luke and Leia paper dolls. Pictured are just a few of the many outfits available. I like the small touches Amy has thrown in such as Luke's Boba Fett underoos and the "cut here" mark on the left hand of his Bespin outfit. ^^ Both dolls and their outfits may be downloaded here. 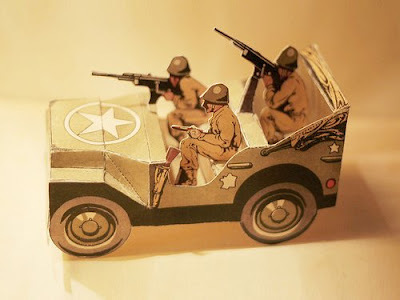 This French paper model was produced in 1944 and depicts three US soldiers in a Jeep. Patrica at the Agence Eureka blog scanned and cleaned up the original template so that it uses less ink to print. Thanks Patrica! A copy of the template may be found here. The first Jeep was produced in 1941 and was known as a "Willys MB". 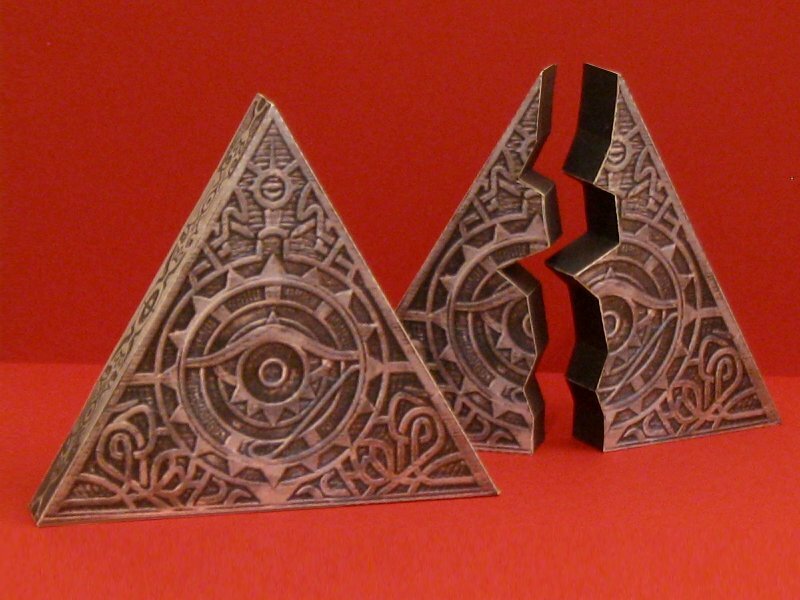 Tim Burton's Nightmare Before Christmas continues to inspire papercraft and paper toys. 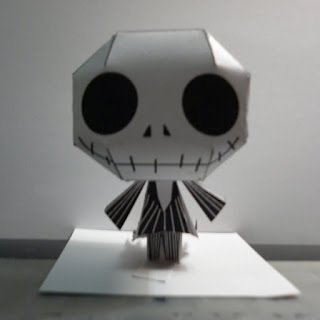 At only six parts, this Jack Skellington paper toy is an easy build. The template by Grim-paper may be downloaded here. The build photo is by hoshiterasu. In the 2001 movie, Lara Croft: Tomb Raider, Lara must locate two halves of a powerful relic known as the Triangle of Light. 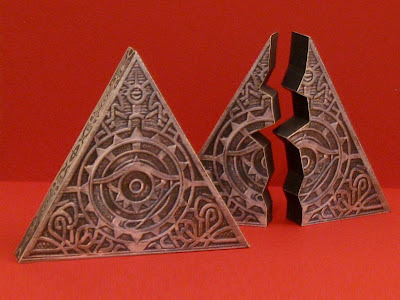 Pictured are two 1:2 scale paper models of the Triangle. One model is of the Triangle when it is whole and the other model shows the Triangle after it is split to prevent misuse of its power. The PDF template for the Triangle of Light includes both the whole and the split versions and comes in both A4 and Letter sizes. This project has been on my to-do list for a long time and I am happy to finally get it completed. Xavier Gale-Sides brings us another excellent Marvel Comics papercraft. This time it is the character Doctor Octopus. Doc Ock is one of Spider-Man's earliest foes, first appearing in Amazing Spider-Man #3 back in 1963. 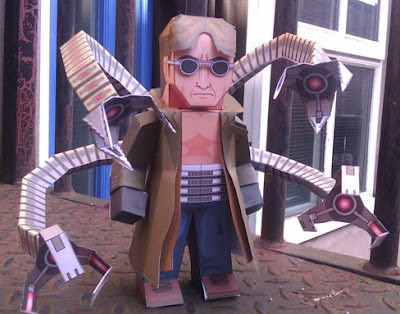 This paper toy is based on the appearance Doctor Octopus took in the Spider-Man 2 movie. The template may be downloaded here. Here's another nice Lord of the Rings Papercraft from Movieman. This helmet is very similar to the one worn by Gimli the Dwarf in the LOTR movies. The template is available in Pepakura PDO format only and may be downloaded here. The PDO is unlocked, so the size of the helmet may be customized. Previous posted LOTR papercraft by Movieman include an Elf helmet and an Orc Axe. Mouse Guard is an award winning comic book series written and illustrated by David Petersen. David has begun creating paper toy likenesses of characters from his comics. 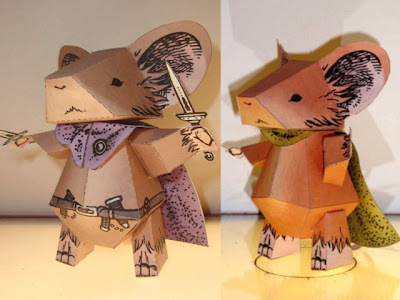 Currently available are PDF templates for the mice, Sadie and Lieam, who are sword wielding mice sworn to protect the common mouse against threats of predator, weather, and wilderness. David plans to create more Mouse Guard paper toys in the future. Paper engineer Tracy Sabin at Paperland is well on his way to creating a 20 piece papercraft city. Currently available are the first four printable paper sculptures of the set: Hero's Fountain, Town Hall, Barrel Organ, and The Bridge. When all 20 individual pieces are finished, the idea is that they will all fit together like a puzzle to form a miniature city called "The Town Square". The residents of The Town Square are animals of various species much like those seen in illustrations by the late Richard Scarry. 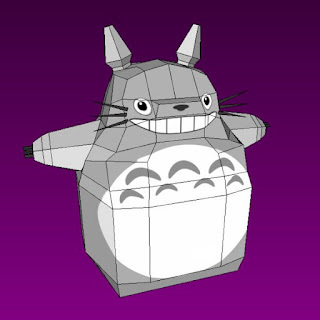 If you have ever been frustrated building one of the more complicated Totoro paper models found on the web, then this papercraft is for you. This Totoro papercraft by Beardrooler takes the creature's rounded shape and translates it into angular shapes that are easy to build. The Pepakura PDO template may be downloaded here. Totoros, of course, are the creation of Japanese animator Hayao Miyazaki. 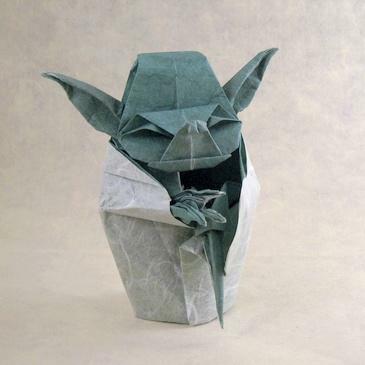 This origami Yoda has been around for a while, but it always makes me smile when I see it. The original origami folding diagram was created by Fumiaki Kawahata. If you are interesting in folding a Yoda yourself, a great set of folding instructions, complete with a video, is available at Marigami Origami. My papercrafter friend Portaldragon did me a huge favor. He unfolded a wolf from League of Legends for me. The finished wolf paper model measures around 12" (30.5 cm) from tip of nose to tip of tail. A download of the wolf is available here. Contained in the download are A4 and Letter size templates in both Pepakura PDO and PDF formats. 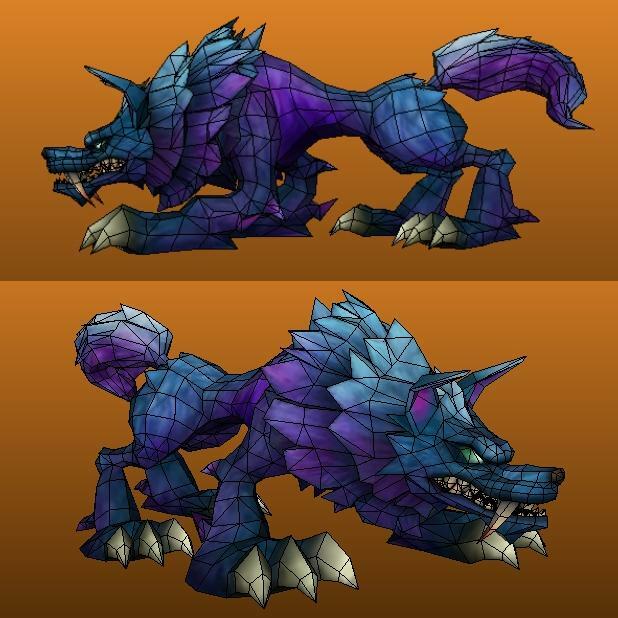 In the LoL video game, wolves are neutral and described as "A fast monster with an increased chance to critically strike its target".